At Sideways 6 we know a thing or two about employee ideas campaigns. From the good to the bad, we've seen it all, and we're dishing up the best advice we've come across! Picture the scene. You're part of an organization brimming with enthusiastic, talented and engaged employees, a buzzing hive of innovative, potentially transformative ideas just waiting to be unleashed. But for some reason, you just can’t capture this possibly game-changing information. It’s like one of those dreams where you’re trying to get somewhere but, try as you might, you just can't run fast enough. It's obviously better than the dream where you turn up to school completely naked, but is still frustrating nonetheless. The fact is that four in five employees have ideas to improve their business, and most companies understand the value of listening to them – so why do the majority of idea campaigns fail to make an impact? We look at the six most common mistakes businesses make when it comes to employee idea campaigns. If you prefer, you can hit the big red play button below and listen to Sideways 6 Founder and CEO, Will Read, talking through the reasons in a 20-minute webinar. Alternatively, if our wordsmithery has you hooked, please read on! We didn't coin the term 'start with why', but we wish we had! The first step towards executing a successful employee ideas campaign is to know why you're carrying out the campaign in the first place. Is the reason powerful enough to ensure that it will be seen through to its conclusion? Failure to establish this will lead to your campaign falling flatter than a pancake on Shrove Tuesday, so remember that no ‘why’ equals no need! Remember, though, it’s not just about the audience – you also need diversity amongst those who are going to review, prioritize and action the ideas generated by the campaign. There's been a number of times that I’ve gone to my manager with ideas to improve our sales process, but I feel it has gone into a black hole. Feedback should be delivered regularly to ensure that your audience is updated as you move through the process, and it should remain consistent with the original challenges that were outlined. Back to that pesky but oh-so-crucial ‘why?’, again! The only ‘official way’ to propose ideas are regular company meetings, where everyone is afraid to speak. This is easily avoided by making things as simple as possible for people to collaborate on ideas. Allow employees to submit ideas on whatever channels are easiest for them – be that the company’s social network, email, intranet or even via SMS. Convenience is key for engagement. 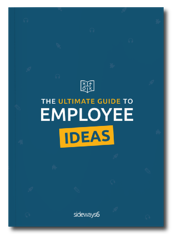 Get your hands on 56 pages of tips, tricks and insights learned from over 250,000 employee ideas.